About a year ago, Simon’s Stamps started looking seriously for a new home. Our lease was expiring, the landlord hinted about doubling our very affordable monthly rent, and we’d have to start paying our own utilities. “Who’s in charge around here?” he demanded angrily. Well, it’s certainly the case that the smell of burning rubber can be obnoxious, but we’ve spent thousands installing special filters to clean the exhaust from our laser engraver, and we’ve installed fans and membranes to keep the odors away from the neighbors. So I was curious as to who was being bothered. I offered a tour to the officious inspector, explained that the air passes OSHA and European health standards, and let him know that we’d be happy to cooperate in any way to comply with the City’s regulations. The next day we got a certified letter from the City demanding that we cease and desist all operations, immediately. Naturally, I disregarded the demand. I was polite about it though. I called the inspector frequently, and sent nice letters, and assured him we would do whatever was needed, which was nothing in my opinion, but I left that part out. Turns out that the complaint was from a disgruntled former tenant upstairs, who had been subletting an apartment and felt we should have given him a larger refund when he left. That’s right – we have people sleeping upstairs while we burn rubber. And there’s a health food coop next door. I decided to concentrate the real estate search in industrial areas, much as I knew we’d miss the ambiance of the cute little downtown we’re in now. In April of 2009, our laser engraver stopped working, which was a business disaster. We had to sub-contract out most of our work, which hurt our customer service, and cost us a lot of money. In addition, the laser engraver manufacturer misdiagnosed the problems, and sold us around $7,000 worth of parts that didn’t fix the problem. We finally concluded that the machine needed a new, very expensive, laser tube. To their credit, the company tried to help us out by offering to sell us a new laser engraver, and to renovate the old one at no charge. We got the financing for the new laser thus doubling our monthly payment. So now we have two production laser engravers. Too bad we only have room for one of them in our current space. The other one is in storage. A mile north of us was an industrial building, where a print shop, one of our wholesale customers, was slowly going out of business. We knew they were going out of business because we couldn’t collect some money they had owed us for many months. When a for sale sign appeared on the building, I asked the Realtor to show me the building. At $250,000 for a 13,000 sf building, it looked like quite a bargain, but it was poorly insulated, would need a new roof soon, and had other deficiencies. In other words, too risky for us to try. However, a young man with a business making organic natural pickles was interested, and he approached us with a proposition. In order to get the bank to finance the deal, he needed to show that he could rent part of the property out. So we signed a “letter of intent” saying that we would rent 4000 sq ft. It was non-binding, but it helped him talk the bank into the deal. A few months went by. Finally he closed on the building, and we began negotiating with him. It immediately became apparent that most Simon’s Stamps employees hated the building. It was moldy, dark, broken up into strange spaces, and it looked to be expensive to heat. The new owner didn’t want to spend money on our space, and I couldn’t really blame him. He was spending a small fortune renovating his part of the building, putting in a special pickle refrigerator, and simultaneously running his business. We weren’t his top priority. We gave up on the pickle site and looked for Plan B. There were now 2½ months left on our lease. I looked at half a dozen places that weren’t great. As it happened, the Realtor knew another space that might be available. The failing print shop had rented part of a 40,000 sf building nearby, but was now giving up entirely, and the landlord was interested in getting a tenant who would pay some rent. The landlord and I had some informal talks, and it seemed like we were close to a deal. We would rent the space vacated by the defunct print shop, as well as another vacant part of the building. The rent would be less than Plan A and was actually not a bad deal for almost 4000 square feet. The landlord also offered to give us a substantial allowance to renovate the space to our needs. One day, I was at the building with the landlord and a couple of our employees, when another tenant in the building approached us. He wanted to talk with the landlord. Seems his high end gift business was slow, and he needed to move out of his space. Would we be interested in reconfiguring our space to include the area where the gift business was? So now we started negotiating on what I called Plan B(2). It was a strange old factory building, almost 100 years old, but we felt we could make it work. I felt some kinship with the landlord, as he had started his own manufacturing business in the building, before he sold the business and retired. The reconfigured space was slightly larger, so the rent went up a few hundred dollars – still a pretty good deal. With less than 2 months left on our lease, I made a formal offer to the landlord and gave him a deposit check. He said he’d accept, but wanted to check with the City Building Inspector, which would take a week or so since the inspector was busy. I waited. What else could I do? I also looked around at a few other properties, just in case. After a week or so, I called the Realtor, who said that the landlord had met with the Building Inspector, and ended up in the hospital with heart trouble! It seems the building inspector had demanded that the entire 100 year old building, all 40,00 square feet of it, be brought up to 2009 standards. The first thing he wanted was a set of architect plans for the building, which would cost $10,000! Apparently the new Massachusetts Building Code allows local building inspectors to do this. I thought it was outrageous, but in small towns, you have to be careful about politics. Besides, the inspector was not looking for a bribe or doing anything illegal. The landlord was still upset, and in fact had threatened to tear down the entire building, rather than pay taxes on it to the City. So the deal was off. We now had about 4 weeks left before we had to be out. Fortunately, we also had a Plan C. A friendly landlord owned a large downtown building, right on Main Street, just a few blocks up from our present location. A record shop (remember them) had gone out of business, and their space was available, along with a huge basement space. I had some concerns – after all we were trying to get away from neighbors who might complain about odors. However, the landlord assured us he could make it work. He offered to install an extension to our filter system, and exhaust everything up a 4 story chimney. He would also upgrade the electric, put in new floors, and basically make the place ready for us to move in. The reasonable rent included heat, and best of all, we thought we could sublet part of the storefront to a bank for an ATM machine. Since the renovations would require a building permit, I thought there might be some issues. But the landlord assured me that he had already upgraded the building, knew everything that the building inspector wanted, and that there would be no problem. In fact he already had an appointment for next week to go over everything with the inspector. So I just had to wait about 10 days, and then we could sign a lease! I started calling moving companies. Oops! There were two problems. First, the inspector wanted lots of very expensive renovations before he would let us move in. More than were close to economically feasible for the landlord. Actually, the renovations might not be legally required, but appealing from the building inspector’s decision is time-consuming, and you usually have to hire lawyers and “code consultants” and an architect. 10 years ago, when Simon’s Stamps first moved to Main Street, I checked with the then Building Inspector to make sure we complied with all the local laws. He thought about us and decided we were a retail store, which was permitted. There was never a question or problem. I downloaded the City zoning laws and read them carefully. Certain “uses” of land are permitted in each zoning district, and Main Street is in the Downtown Commercial district. But what sort of land “use” are we? We develop websites and sell stuff on the Internet We talk on the phone. We email customers. So I guess we’re a “professional office.” But we also design stuff. We have graphic artists and typesetters and proofreaders. We make stuff to print images with. So we could be a “graphic artist’s workshop.” Of course our face to the brick and mortar world is our retail storefront, where we display and sell art stamps, ink pads and such. From the street we look like a “retail store”, and the fact that we also sell online shouldn’t disqualify us from that category. After all, even Macy’s has a website these days, and they’re still a retail store, right? All of those uses are permitted in the Downtown Commercial district. However, the building inspector decided to call us a manufacturer, and “manufacturing” is not a permitted use. Unless you request a special variance, which would take months to apply for, be very expensive, and might not be granted. Plan C was not working. We now had 7 days until our lease expired. I called my lawyer. I made a lot of phone calls to try to find another place. In the nearby village of Turners Falls, there had been a space available about a year ago. When I called the landlord, the space had been rented, but he might have another one available soon. One of his tenants seemed to be vacating 4,200 square feet, and hadn’t paid rent in some time. Would we be interested? “Sure,” I said. “Can we take a look?” Even though the tenant hadn’t moved out, we snuck in and looked around. Don’t tell anyone! The Turners Falls space was zoned “industrial,” but retail stores were permitted as an “accessory use.” So your factory could have a little showroom. I decided we were now a factory, and that we would have a little showroom. The Turners Falls building inspector didn’t have any problem with that. Also, the building, affectionately called “Plan D” by everyone at Simon’s Stamps, didn’t need much renovation. It was modern, insulated, had handicap accessible bathrooms, and the floors and walls were level. The electricity needed some upgrades, and we needed wiring for our computers and telephones. Plan D was starting to look very good. I made a formal offer and gave the landlord a deposit check! The rent was a little higher than the other spaces, but one of our laser engraver leases would be paid off in another month. Also, the building was right next door to a beautiful bike path and a canal. In the afternoon sun, the ripples on the Connecticut River, the migrating geese, and the historic mill buildings were enchanting me. It was peaceful. I needed peaceful. The landlord seemed to be very busy. Every time I called, I had to leave a voice mail, and he never called back. Obviously we weren’t his top priority. 10 days after giving him the offer and deposit, I got in my car and went hunting. Did I tell you Turners Falls is a small town? I saw his truck in front of one of his buildings, and went in and found him. Naturally he was just about to run off to a meeting and couldn’t talk, but I made an appointment for 1:00 PM the next day. When I got back to the office, there was a voice mail waiting for me. It was from the Greenfield Building inspector. He wanted to meet at the Greenfield location (Plan B(2)). There might be some way to work things out. The only time he could meet us was at 2:00 tomorrow, since he was very busy. So at 1:00 I met with the landlord for the Plan D Building. Unfortunately, perhaps sensing our predicament, he was unwilling to give us any credits for upgrading. He’d do some work for us, and repaint the walls, etc., but we’d still need to spend a substantial amount on electricians and such. That was on top of our other anticipated expenses, like movers, new stationery, signs, the cost of being closed a few days, etc. We were still recovering from the laser engraver ordeal, and sales were down slightly due to the recession. I called an emergency management meeting with my production manager and my bookkeeper. Then I rushed to the 2:00 meeting with the Building Inspector. Here I explained that if we moved to this location we would willingly forego our “retail store”, and just operate as the “manufacturer” he seemed to consider us to be. The giant building had been a factory since 1912, and we were just going to continue the manufacturing use it had always been. He said he’d get back to us on that. I also asked the inspector if there was any law against our occupying the building while the architects completed their drawings and the landlord and his contractors got things renovated to his satisfaction. I actually asked him this 3 times, and each time he didn’t answer directly, saying instead that “it was better” to wait until he was satisfied with the renovations, or at least the negotiations about the renovations. I definitely got the sense that I’d be picking a fight I wouldn’t enjoy if I moved my business in without his permission – law or no law. Nonetheless, it still appeared possible. The landlord had hired a different architect, one I recommended, who charges significantly less. Maybe she and the building inspector would come to an agreement. Maybe we could move here and not need to come up with the thousands for renovating. I called this possible option Plan B(3). Meanwhile, my lawyer finally called back. He advised me to politely ask our present landlord for a 30 day extension. He also explained that landlords in Massachusetts can’t just start moving stuff out onto the sidewalk. They need to hire certified movers and put the stuff into approved safe storage areas. Also, the landlord would need a court order, and those took a few weeks to get. So we didn’t really have to be out on September 30. Good. It was the 28th. At the emergency management meeting, I went over our options. Since we didn’t want to be out on the street, we had to move somewhere, expensive or not. We devised a plan to raise some money. The US Citizenship and Immigration Service owed us money, and it was overdue. Perhaps we could persuade them to pay us sometime soon. One of our employees had just moved to California to pursue his artistic dreams. We could save a few thousand by delaying hiring his replacement. We could sell down our inventory. We had a tiny amount left on our line of credit at the bank. We could turn down offers to work on barter, insisting on cash only. A few vendors might be willing to let us pay later. Well, it was an emergency, and we had to do what we could. We put the plan into effect immediately. We’re scrounging for cash. By this point I was not able to think very clearly about anything except real estate. I wasn’t making sales calls. I wasn’t able to concentrate on improving our websites. Our Federal Government contract needed to be renewed, and I forgot all about it. I forgot to buy gas and almost ran out on the highway…with my 6 year old. Fortunately my employees are capable of running day to day operations without me. I’ve been meaning to say a special prayer of thanksgiving for them. The following days, Angie, my production manager, and I went out to see some more buildings – ones we had rejected in the past. We were determined to look with a fresh eye, to see if we could make any space work. One such building was in the old Millers Falls Tool complex. Hundreds of thousands of square feet in the tiny village of Millers Falls were once used to manufacture some of the finest hand tools. They had their own power canal. the entire building had conveyor belts. It was beyond huge. Sadly, all 1300 jobs had been lost to the area, first to New Jersey in 1982, and then mainly to China. It was part of a trend – for some reason, few manufacturing businesses are able to survive in Massachusetts. In recent decades, Renovator’s Supply, a mail order business selling hard to find parts for old houses, operated in the building. They were a $35,000,000 business, and had hundreds of employees manufacturing a huge array of high end door knobs, hardware, sinks, etc. They had put millions into renovating their own antique factory, essentially constructing a building inside a building so as to maintain the old facade and operate a modern plant inside. Sure enough, they couldn’t compete in Massachusetts either. Now, most of their manufacturing is done in China and India. Even their typesetting and catalog design is done overseas. Hence, lots of available space they’d like to rent out. Unfortunately, the rent was too high, the place was too far from our employees’ homes, and the whole thing didn’t quite feel right. There was a great space in Amherst. A former laboratory with offices, manufacturing and shipping areas. Too bad it was priced about triple the other spaces. Then we returned to a building we had seen before in South Deerfield. A modern, clean steel building, it had everything we needed, and we could practically move right in. The rent was reasonable. Unfortunately, 2 of our employees were totally upset with the South Deerfield location. It was too far away for them. They threatened to quit if we moved there. Nonetheless, if we had to move there we could, and it would be better to lose two employees than to have the business be homeless. South Deerfield became Plan E.
Oh, and there was a Plan F as well. If we really can’t find a place to manufacture our stamps and signs, we could go virtual. The website could be run from a laptop in my home office, or for that matter from an Internet cafe in the Bahamas. Everything could be subcontracted out, and our vendors could drop ship for us. A few of our online competitors already seem to be doing this, and I can see why. The business would need no employees, pay no rent, no utilities, and be practically invisible to the government. But for some reason, I can’t quite take Plan F seriously. It doesn’t feel right. We’re still waiting to see if the Greenfield Building Inspector will ever let us move into the Plan B(3) space. And a proposed lease has been sitting for days on the desk of the Plan D landlord. Maybe I should call moving companies again. Simon’s Stamps has long been “powered by uTypia“. That is, uTypia’s server in Vienna runs the software that allows you to design your own stamp and display it on your monitor. When you’re done, the information, including your design, is sent back to our server and entered into production. Unfortunately, uTypia has been less than 100% reliable, so we’ve been looking into switching to another application server, ConnectWeb. We’ve been getting the new site set up, testing, etc. Then, last Saturday, uTypia’s server was down all day. They didn’t even notify us. Nobody could place an order. Not only was this costing us money, it was annoying our customers. So we decided to imediately switch to the ConnectWeb service, even though we weren’t finished testing it. After all, it’s better than a big “Your browser cannot display the webpage” message. Fortunately, after a bit of tweaking, the new, improved website is working fine. We think you’ll like the improved shipping charge calculations, the ability to immediately produce a PDF proof, and the simplicity of the ordering process. If you don’t, you can still access the old site. (uTypia’s servers are working again.) Just go to http://shop.simonstamp.com. If you’ve already registered and want to pull up one of your old orders, that’s where to look for it. If you’re not familiar with letterboxing, we’d like to introduce you to something that we think is kind of cool. It’s similar to geocaching, in that it’s a little bit scavenger hunt, a little bit science, and a little bit problem-solving. Letterboxing actually has a long history, dating back to 1854, and there a number of different kinds of letterboxes as well. While there are a number of similar things in the States, such as folks hiking the Appalachian Trail and folks checking in to hostels, letterboxing is considered more of a hobby rather than a tracking system (check out the Wikipedia article for a little bit more information about letterboxing and the different kinds out there). We have a full line of Color Box stamp pads in our shop, which are ideal for printing on paper, as well as the Ancient Page line, which is best for glossy papers. 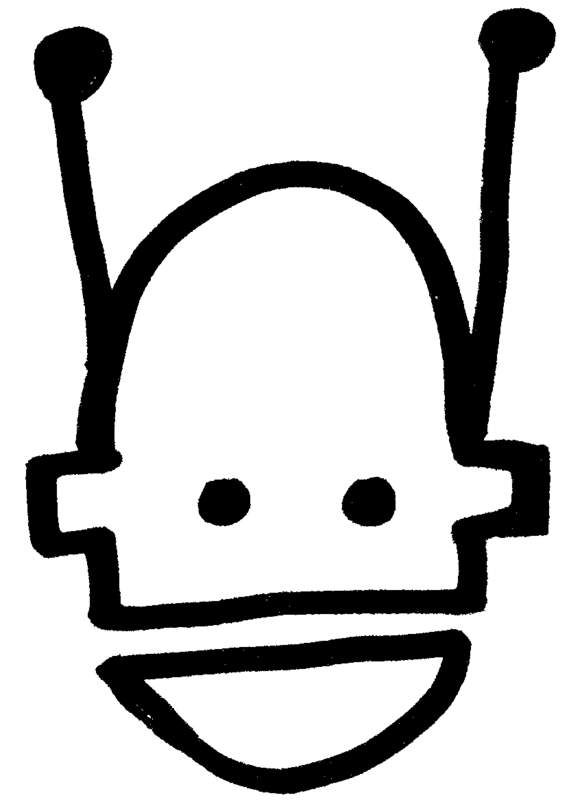 But what we’re really excited about is that we’ve just added a whole bunch of new stamp designs for the shop, like this little robot guy here drawn by one of our employees). Stop in and see the selection of our stamps ranging from quirky to classic! Saturday: 9:00 AM to 1:00 PM Eastern Time (GMT -5).